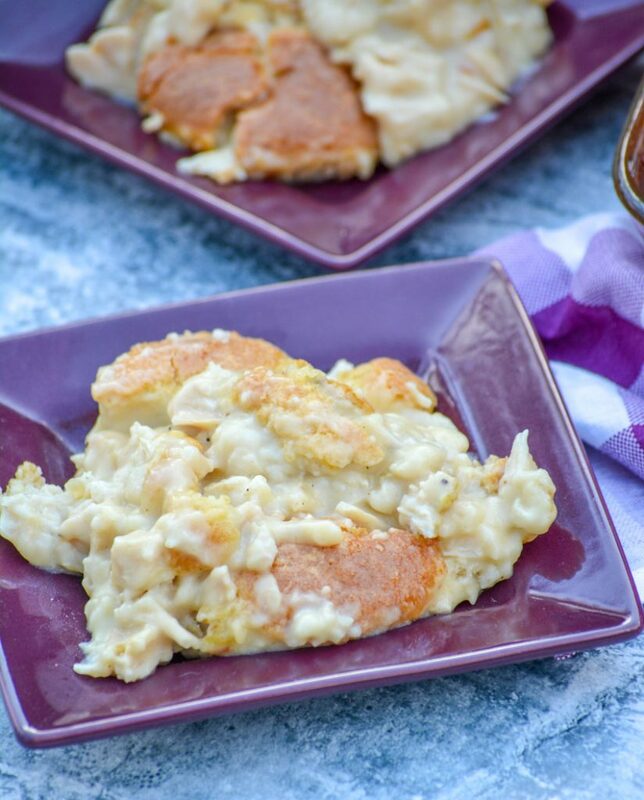 Chicken & dumplings are the stuff of Southern legend. You won’t fond an old bitty who doesn’t have her own tried and true recipe for the stuff. I actually have an Aunt Bitty. My Grandma’s youngest sister. She hated that nickname all her life, despite the fact that it meant cute as a little bitty newborn chick. I’ve yet to come across a recipe for them that’s bad though. Different sure, many similar- but never bad. In fact, they’re all pretty darn good. They tend to adhere to the same basics. They all do tend to have one small thing or another that sets them apart from the others. Whether it’s a spice, a different cooking technique, or even an original origin story. I grew up in the South, where chicken & dumplings were super popular. Almost common fare. Fat chunks of savory chicken, interspersed with pillow-y dumplings, all bathing together in a thick, rich, velvety sauce. It was a dish I loved as a kid, and one I loved serving to my own family as an adult. 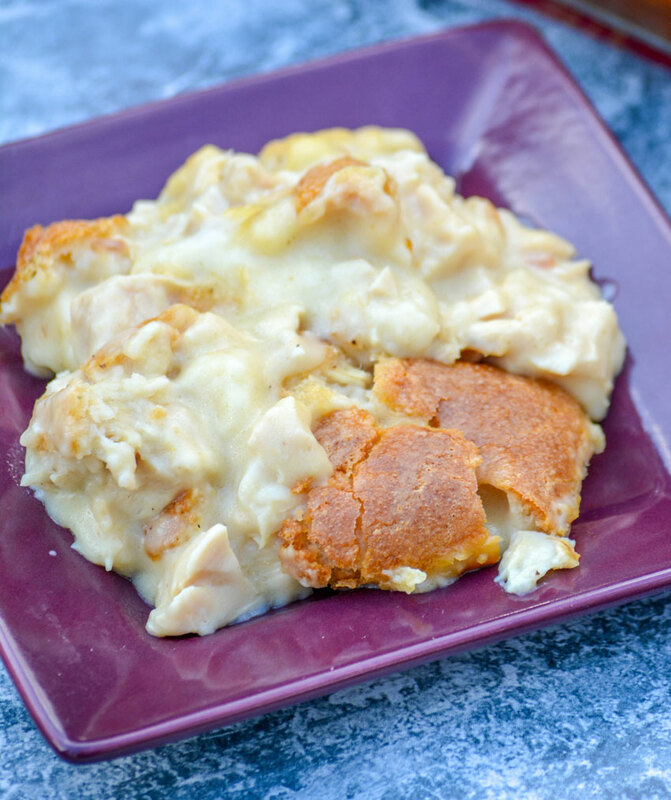 Per my usual, I had to put my own spin on things and this flavorful Chicken & Dumping Casserole was the happy result. 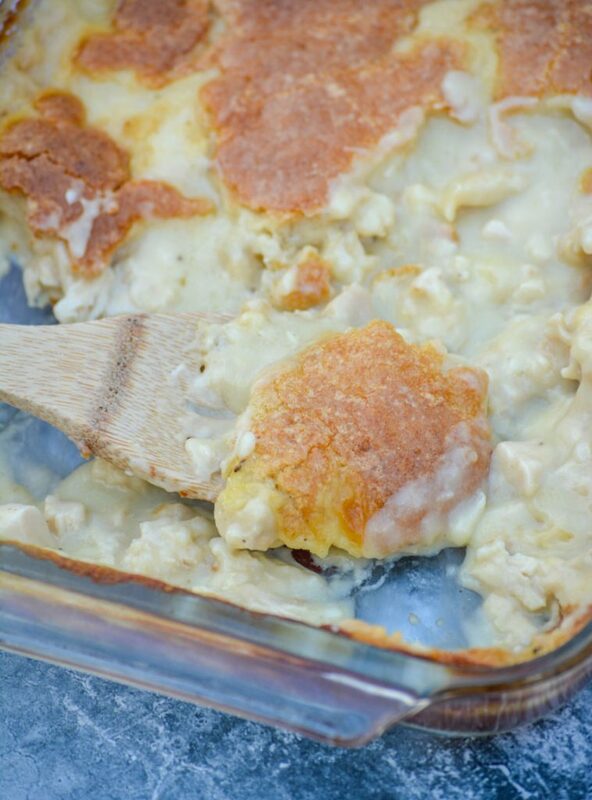 It ended up being the most delicious hybrid- a cross between chicken & dumplings and a chicken cobbler. Chicken cobbler ring a bell? In the South, that might also accurately describe the texture of this dish. I love a good chicken cobbler. Really, it is a good description of how the ‘dumplings’ turn out. With the golden brown crust they form that’s dumplin’ like on the underside. 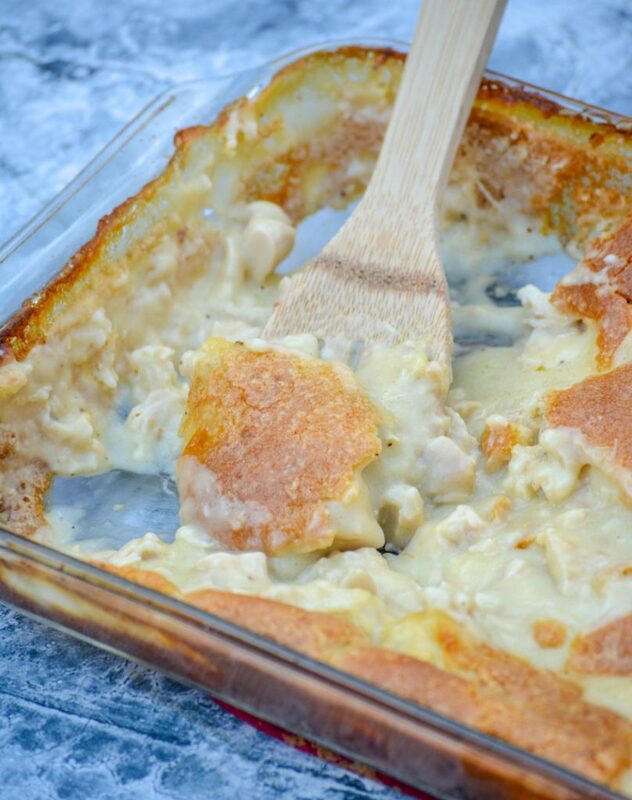 Actual chicken cobbler tends to have a solid, uniform crust on top that’s soft on the underside. Chicken & Dumping Casserole has a golden brown crust, but it’s broken up into more dumpling like pieces. It also cooks up from underneath, absorbing all the flavors along the way. It’s the best of both worlds. On top, a golden browned flaky crust and underneath, in with the chunks of chicken and savory sauce, soft tender dumplings. This casserole is actually really simple to whip up. 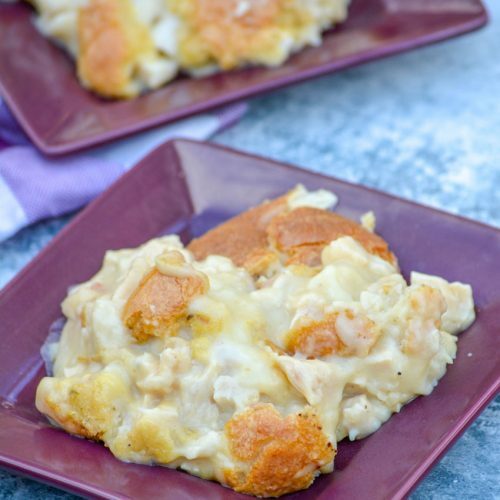 It features three distinct layers- buttery chicken, the bisquick dumplings, and the savory cream sauce. It’s very important when assembling that you DO NOT mix the layers, following the recipe exactly as written. Trust me on this, magic happens when it bakes in the oven. Plus if mixed, you won’t get dumplings swimming in sauce- you’ll get soft sludge. Nobody wants that! Preheat your oven to 350 degrees, add the stick of butter to the dish, and then stick it into the oven just until the butter’s melted. Now we add the chicken layer. In the recipe card I suggest using poached, shredded breasts. This is still my preferred method since it tastes more ‘authentic’, but you can easily sub chopped rotisserie chicken for that. Evenly spread the chicken out into the bottom of the butter coated dish. Salt & pepper the chicken, to taste. For the first liquid layer, whisk together the bisquick, half & half, and thyme. Here again you’ve got some room for substitutions. You can sub milk for the half and half, although I would stick with a milk with a little fat- say 2%. Also, if you don’t have ground thyme, sage will also work. Slowly pour this mixture out over the chicken. In a separate mixing bowl, whisk together chicken broth, cream of chicken soup, poultry seasoning, garlic, & onion powders until smooth. Slowly, so as not to disturb the rest of the dish, pour this mixture evenly into the casserole dish. Bake the Chicken & Dumping Casserole for 50-60 minutes, or until it’s set and the top’s transformed into a golden brown crust. You really can’t beat this dish. The authentic Southern flavors you’re craving, made in a simple casserole dish, in half the time- it’s like Grandma & Mama used to make, but on a budget. 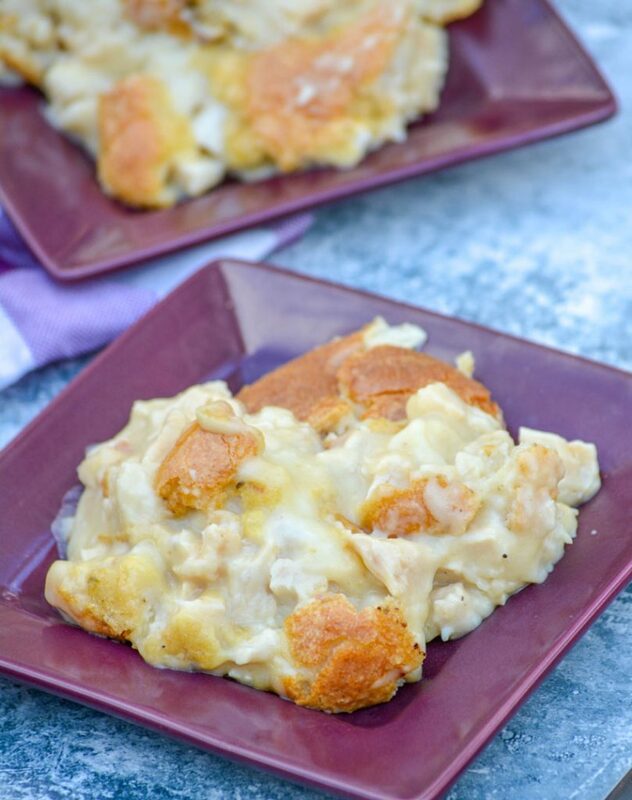 A creamy layered casserole, this simple dish cooks up into pure Southern comfort food with chicken & fluffy bisquick dumplings smothered in a savory sauce. Preheat the oven to 350 degrees. Add the stick of butter to a 9x13" baking dish, and place it in the preheating oven just until melted. Spread the chicken evenly out over the bottom of the dish. Salt & pepper the chicken layer, to taste. Do NOT MIX the layers, and follow the steps exactly. In a small mixing bowl, whisk together the bisquick, half & half, and thyme until evenly combined. Slowly pour the mixture evenly out over the chicken, so as not to move the chicken around. In another mixing bowl, whisk together the broth, soup, poultry seasoning, garlic, & onion powder until evenly combined. Again, slowly pour this mixture evenly out over the bisquick layer- again careful not to disturb it too much. Bake the casserole at 350 degrees for 50-60 minutes, or until the casserole is set and the top has formed a gorgeous golden browned crust. This is pure-D comfort food! Can’t wait to try it! !